• For quantitative determination of α-amylase activity. • Sensitive and accurate. 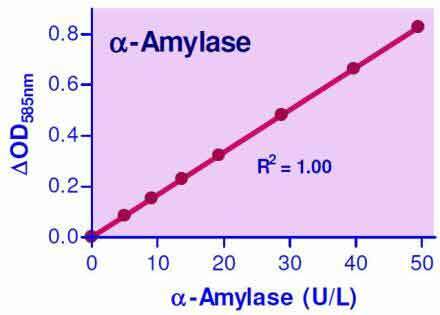 Linear detection range 0.3 to 50 U/L α-amylase in 96-well plate assay. • Convenient. The procedure involves adding a single working reagent, incubation for 15 min, followed by the detection reagent and a 20-min incubation and reading the optical density at 585 nm. • AMYLASE belongs to the family of glycoside hydrolase enzymes that break down starch into glucose molecules by acting on α-1,4-glycosidic bonds. The α-amylases (EC 3.2.1.1) cleave at random locations on the starch chain, ultimately yielding maltotriose and maltose, glucose and "limit dextrin" from amylose and amylopectin. In mammals, ?-amylase is a major digestive enzyme. Increased enzyme levels in humans are associated with salivary trauma, mumps due to inflammation of the salivary glands, pancreatitis and renal failure. Simple, direct and automation-ready procedures for measuring amylase activity are very desirable. BioAssay Systems? EnzyChrom™ a-amylase assay method involves two steps: (1). α-amylase in the sample hydrolyzes starch and the product is rapidly converted to glucose by α-glucosidase and hydrogen peroxide by glucose oxidase; (2). hydrogen peroxide concentration is determined with a colorimetric reagent. 11. Does glucose interfere with the assay? - For samples known to contain glucose, use a membrane filter (e.g. Microcon YM-10 from Millipore) to remove glucose: load 50 ?L sample in a Microcon YM-10 (10 kDa cutoff) and add 500 ?L Assay Buffer. - Centrifuge at 14000 rpm for 30 min, check level of sample, ideally the sample level will be less than 50 ?L. Add 500 ?L Assay Buffer and repeat the centrifugation. Measure final sample volume with a pipetman and calculate dilution factor n = final sample volume/50 ?L. 1. Mohannad N et al (2014). Age-related changes in salivary biomarkers. Journal of Dental Sciences. 9(1): 85-90. Assay: a-Amylase in Human Saliva. 2. S. B. Lee et al (2013). Effect of Oral Administration of Intact Casein on Gastrointestinal Hormone Secretion and Pancreatic ?-Amylase Activity in Korean Native Steer. Asian-Australasian Journal of Animal Sciences (AJAS). 26(5): 654-660. Assay: a-Amylase in steers (cow) pancreas (duodenal fluid). 3. Lee, Kyung-Hoon, et al.(2014). Identification of proteins involved in the pancreatic exocrine by exogenous ghrelin administration in Sprague-Dawley rats. J. Animal Sci. Techn. 56.1 : 6. Assay: a-Amylase in Rat plasma. 4. Abu Khadra, KM et al (2014)/ Antioxidant Profile of Saliva among Young Men Using Mobile Phones. Jordan Journal of Biological Sciences. 7(4):275-280. 5.Han, Mee-Jung, and Seung Hwan Lee (2015). An efficient bacterial surface display system based on a novel outer membrane anchoring element from the Escherichia coli protein YiaT. FEMS Microbiol. Lett. 362.1: 1-7. Assay: a-Amylase in Bacillus subtilis (bacteria) cells. 6. "Lee, KH et al (2014). Identification of proteins involved in the pancreatic exocrine by exogenous ghrelin administration in Sprague-Dawley rats. Journal of Animal Science and Technology. 56:6 Assay: Pancreas Tissue in Sprague-Dawley rats (Pubmed).